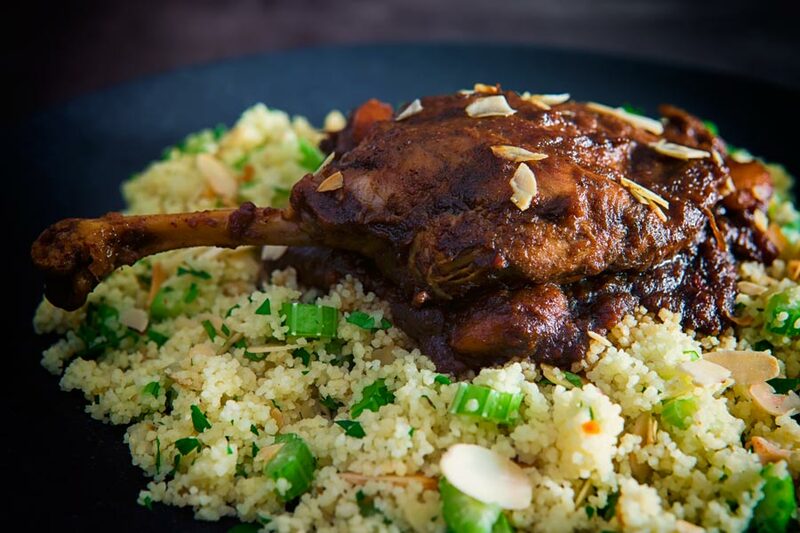 These slow roast duck legs are cooked in a rich tamarind and date sauce that is boldly flavoured and rocks the whole sweet and sour vibe. 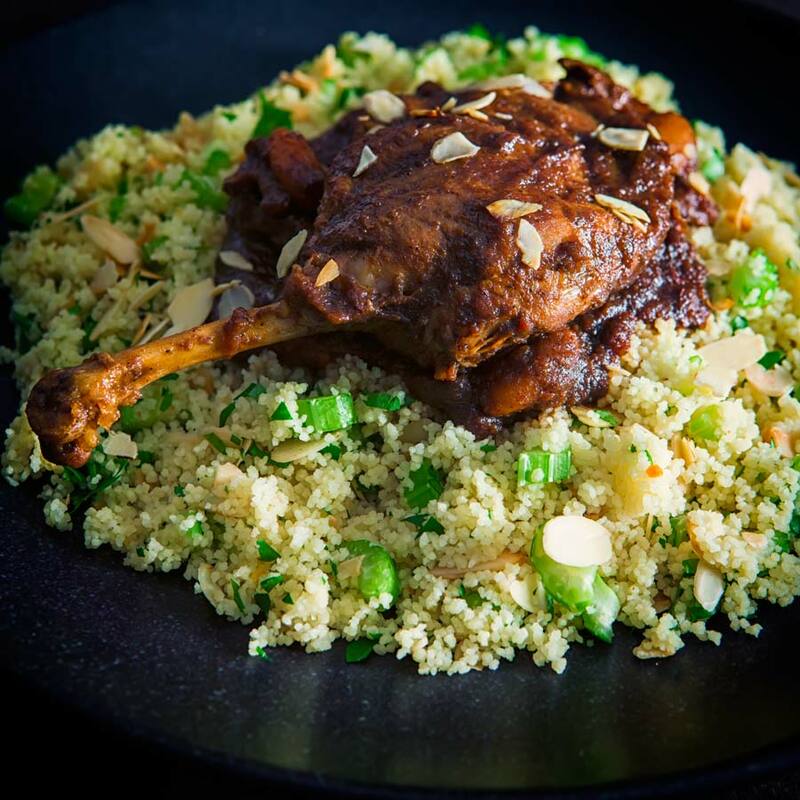 Slow Roast Duck Legs With Dates and Tamarind. These slow roast duck legs are cooked in the most incredible sweet and sour date and tamarind sauce. This recipe has some serious cohones in the flavour department. I have been cooking some pretty classical and subtle flavours of late and figured it was time for a bit of ‘bold’. When it comes to a flavour combination sweet and sour takes some beating for me. I use it in places you would expect like sweet and sour chicken, but also in salads, soups and stews. This stew is very North African or Persian in influence, a place where sweet and sour flavours are very much embraced in savoury food. 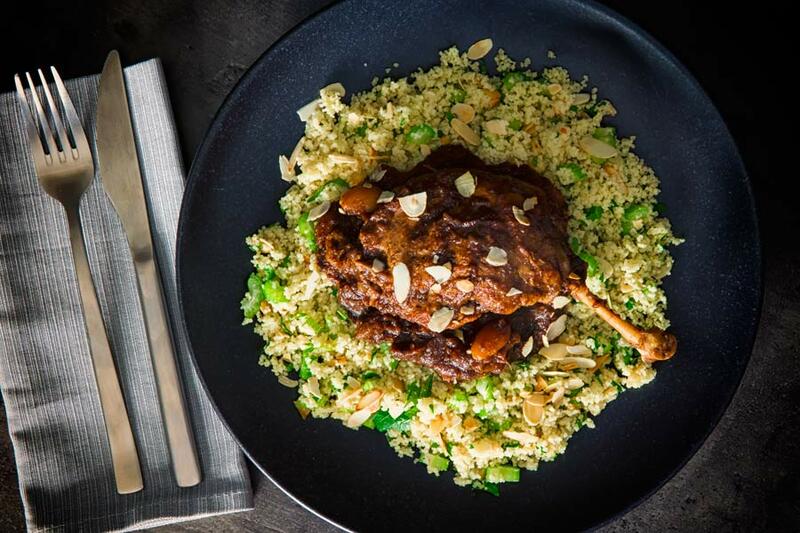 Here we hook up the rich duck with earthy sour tamarind, sweet and sticky dates and then serve it on a simple salty couscous to balance it all out. If you have been following me for a while you cannot help but notice that I am rather fond of duck. These roast duck legs join a host of other duck recipes. Everything from a whole roast duck to duck legs and classically cooked duck breast are all given my attention regularly. In the past 10 years duck has probably become my favourite treat meat to eat. Before I left the UK I would definitely have said lamb, but the difficulty in sourcing lamb here has shifted my focus. In many ways, they are a similar source of protein. Both are big in flavour, pretty heavy on fat and capable of standing up to other big flavours. Like lamb slowly cooked it is wonderful but the right cut is beautiful quickly cooked and left pink. Here our duck legs are slowly cooked and served with a big sticky sauce. Dates are the fruit of the date palm tree. Native to the middle east they have been used as a food for thousands of years. In this recipe they form a very similar role to the one that they take in my sweet potato and date tagine. That is they are there to provide a base sticky sweetness to the sauce that accompanies these roast duck legs. They are actually a really versatile ingredient, my wife loves them as a snack. But wrapped in bacon they make a classic appetiser, pureed or braised as they are here they add a sweet depth to a stew. You can also steep them in booze and use them to top desserts like rice pudding or even ice cream. They are even perfectly comfortable on a cheese board! How To Skin A Duck Leg. Ordinarily, I am an advocate of cooking duck with the skin on. However, for this recipe the sauce becomes way too greasy if you roast duck legs with the skin on. But the good news is that removing the skin from a duck leg is pretty simple. Begin by cutting around the ‘ankle’ with a sharp knife, taking care to cut through all of the tendons. Just like a chicken leg, there is a loose flap of skin to the side of the thigh where it has been removed from the carcass. Sliding a finger in here will allow you to loosen the skin and pull it off. You will typically find that doing this leaves a fatty deposit towards the back of the thigh. Just trim this off because it will add fat to the sauce that we do not want. You can pop the knuckle off the bottom of the leg if you want, just apply pressure with your thumbs. These roast duck legs are slowly cooked in a rich date and tamarind sauce that is boldly flavoured and rocks the whole sweet and sour vibe! Season your duck legs with salt and pepper and then brown in a dry pan over a medium high heat. Roughly chop the onion and chili and add to a blender. Add in half of the dates and the tomato passata and the herbs and spices and blend to a smooth paste. Adding a little water may help this. Add this paste to the pan that we browned the duck in, season well with salt and cook out on a medium heat for 5 minutes. Add in the tamarind paste, honey, the remaining dates that have been roughly chopped and the blanched almonds. Return the duck legs to the pan, add a tight-fitting lid and roast in the oven at 150°C or 300°F for 2 hours. 5 or 6 minutes before you are ready to serve finely dice your celery. Place the parsley in a bowl with the couscous. Pour over the boiling chicken stock and cover with cling film for 5 minutes. Toast the almonds and chop the parsley. After the couscous has plumped up add the oil, parsley and almonds and fork to fluff up. Okay, Brian, this looks good. I have never made Duck before but I’m really loving this. I guess it’s time I give it a shot. I am always looking for low fat duck recipes – this is the one. I only have tamarind paste – how much should I use? Hey Sandie… Ordinarily, I would scoff at removing the skin from duck but I think it is pretty important in this recipe otherwise you end up with something swimming in duck fat. I do save the skin and render it down in the oven though and use it for roasting veggies or for Yorkshire Puds. I have done a little research and general concensus is that tamarind pasta should be used at the rate of somewhere between half and two thirds of the amount taken from freshly made tamarind from dried pulp. I seem to be frequenting your site as I’m constantly lured in by the gorgeous photos and creative flavor combinations. 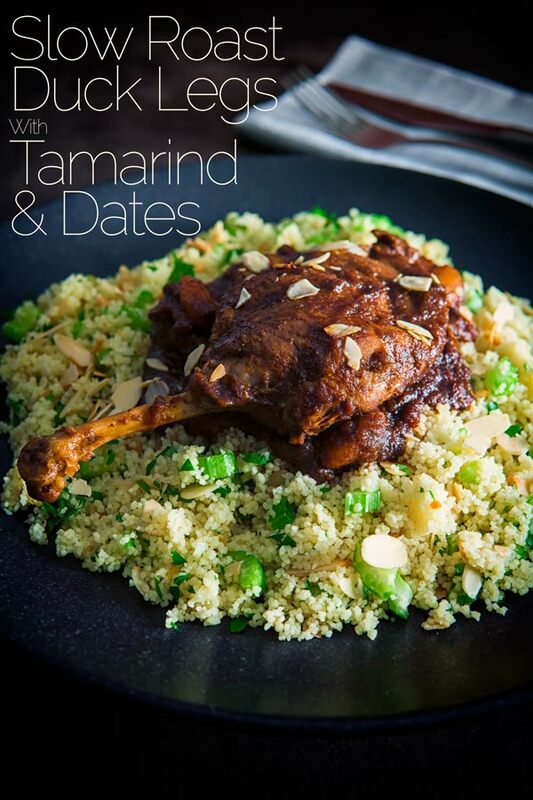 Tamarind and dates sound amazing together, and I’ve never tried anything with the two. And “slow roast” is magic to my ears. I rarely cook with duck, so this will be a treat. Another beautiful recipe. 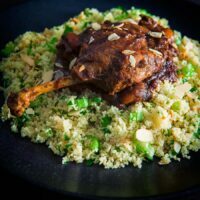 Another Great recipe… I absolutely love roasted duck, I’ve never used tamarind with duck before but sure going to try it! looks delicious! You had my attention with the pairing of duck and dates! what I love about this recipe (besides the flavours) is that you remove the skin from the duck legs. Will be giving this a go for sure. What a fabulous dinner! I’ve never made duck before but looks like I need to get on that! Duck is such a great meat and it has so much flavour making it ideal for recipes like this. This sounds incredible Brian. I absolutely love duck, and tamarind is really one of my all time favorite flavors. 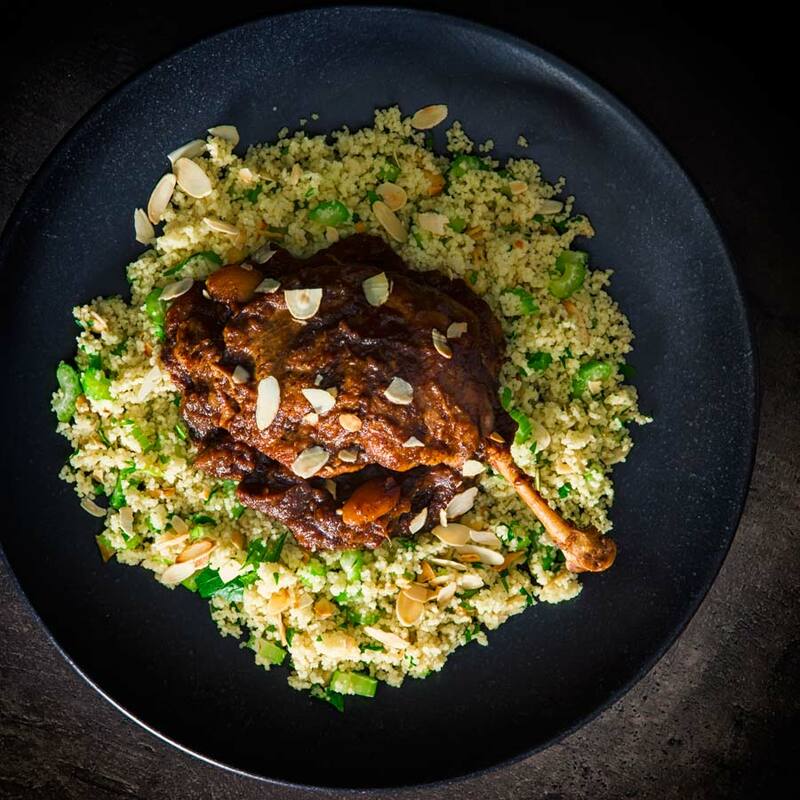 This is such a great recipe – and that duck is mouthwatering! Duck is such a delicious meat and so good to serve with strong flavours. I love the idea of the sweet and sour, particularly using dates, such a natural sweetness. This looks like a wonderful meal and something I could easily impress guests with. Cheers Helen. I always think duck feels a little bit special whilst being simple to cook, you could really scale this up and make it the centre piece of a big meal without any trouble at all.